A day of relaxing and not doing much. We took the water bus to the Island of Lido. The Lido, or Venice Lido, is an 11-kilometre long sandbar in Venice just off the main island. It is home to about 20,000 residents and a favorite spot for vacationers as the beach is large and inviting. It is just a water bus ride away – about 15 minutes across the bay. After arriving the first big surprise was to see cars, buses and scooters all over the place! This, after being in Venice that has NO cars what so ever was a surprise. We stopped for a nice espresso and sweet before walking towards the beach. While we didn’t actually walk on the beach, we could see it as we strolled along. As this is Venice, really, there was of course a canal. but the bridge over it was not steps! (every bridge over a canal in Venice is at least 8 steps up and 8 steps down….so finding a bridge without steps was nice!). After our stroll, we stopped at Glacial, a nice little spot along the main road. Janeen had pasta and clams and I had a 4 cheese salad. The pile of clam shells after she finished her lunch was huge. After lunch, we went back to the landing and hoped on the water bus to get back to our hotel. Along the way captured a few nice pictures of sites along the way. This equestrian statue was quite impressive. This pole was part of a navy memorial. Here we are after passing under the Rialto Bridge -It is the oldest bridge across the canal, and was the dividing line for the districts of San Marco and San Polo. It was built in 1588. For all you construction folks following along, this is a picture of a dumpster. Yet planned for the day is an afternoon with G&T’s at our hotel, dinner out and a rain storm to follow. ps…if you are following along please let me know…. Tuesday – another day to explore this wonderful part of Italy with a walking tour of Saint Marks and the Doge’s Palace. We started off taking the water bus and took a great picture of our hotel. Our room is on the 2nd level (3 floor for all you untravelled folks) on the left side of the for “arched” windows in the middle. Nice place. After getting off the water bus, we walked through the Campo Santi Glovanni e Paolo area and did a bit of shopping. where Janeen got a couple of unique glass pieces of jewelry. After a nice lunch, we went to Saint Marks Square to hook up with our guide for a walking tour. This included great info about Saint Marks, the building of the place (it’s over 1000 years old!) and general information about the Islands of Venice. This Clock Tower – with the Bell Ringers on the top has a digital clock! in this picture you can see it is 3 O’Clock! Way cool and VERY old. Inside St Marks, it is fantastically beautiful with the entire structure covered with mosaic tiles – with gold leaf so they really shine. We saw the four bronze horses and talked about the details of the exterior truly an amazing feat of construction during a time when everything was done by hand. After our walk through of Saint Marks, we went next door to visit the Doge’s Palace. This was the center of Government until the late 1700’s with large spaces meant to impress foreign delegations -such as the ceiling over the stairs going to the various rooms. and the ceilings and walls of those rooms The last part of this tour was to the various jail cells and across the Bridge of Sighs. Not a lovely spot to have to spend any time – cold, damp, little light and really no way to see the sky. After our walking tour, we were scheduled for the Grand Canal boat tour which took us through the entire length of the Canal pointing out historical sites – all of which are incredibly maintained over the ages. Including the oldest gondola builders in Venice. .
Harry’s Bar which was opened in 1931 and has hosted a number of notable customers have included Charlie Chaplin, Alfred Hitchcock, Richard Halliburton, Truman Capote, Orson Welles, Baron Philippe de Rothschild, Princess Aspasia of Greece, Aristotle Onassis, Barbara Hutton, Woody Allen and now David and Janeen Lee! Admittedly it was a bit pricy but hey, now we are associated with some really famous people. Admittedly the food and service where top notch, but so was the cost of the meal. After dinner, we caught the water bus and headed home. Another 10,000 step day! After crashing for 10 or 12 hours, we got up and had a delightful breakfast at our hotel. I think we were the only ones who figured out how to get a cappuccino at breakfast – and they were good. With nothing really planned until 5PM we headed out and just walked around. First we threaded our way through the Rialto Market – but it wasn’t up and running, so nothing really to report except we will hit it again in the next few days. There always seems to be a nice view of the Grand Canal so, naturally I have to take our picture. After a while, we found our way to Saint Marks Square and had tea and scones with jam. For entertainment, of course with an added fee, was this little musical group playing wonderful traditional Vencian music. From there, we headed towards the Accademia Museum but first we walked through a number of shops and stalls without buying anything! Janeen had the menu of the day, Risotto with clams and mussels and I had a Caprese salad along with a great local white wine. We had scheduled to be on a Grand Canal Tour at 5 so we head back across the Canal (getting lost of course) only to find the tour had already been sold out! Frustrating for sure (we booked another cruise for tomorrow). We ended up buying a 3 day pass for the water bus so headed back to our room and had drinks on the patio. Not a bad spot to relax for sure and the prices are really quite good! Two cocktails for 14 euros. As Janeen was hungry, we got a recommendation from our hotel and walked over to Muro – about 1000 yards from our pace and had wonderful pasta (Janeen) and lamb (David). Tomorrow afternoon we have a walking tour of Saint Marks and the Grand Canal tour – both in the afternoon / early evening so will have the morning to just explore. I can certainly say we are getting into the vacation / travel mode very easily and it’s only the second day! 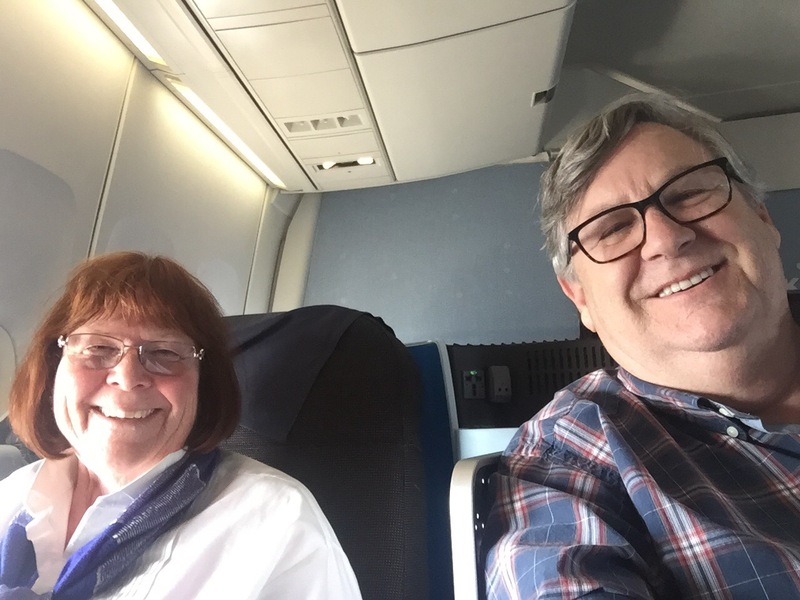 Well, after flying 10 hours we got to Amsterdam – could have been any airport anywhere in the world – lots of different languages but still all the same hurry hurry hurry like any big airport in the world. While getting to the KLM lounge to relax for a bit, we must have gone by at least 3 different Starbucks! We had a couple of hours to kill before our flight to Venice and the KLM lounge was a nice spot to do that. The flight to Venice took about 1-1/2 and was quite uneventful. Over the last several weeks, we had been checking the weather and it was always calling for rain. Nice to arrive to blue skies and fluffy white clouds. Thanks to Kim, our travel agent, we had a dedicated taxi – booked to get us to hour hotel. After a quick water trip, we arrived at our Hotel and got checked in. This lovely room overlooks the Grand Canal! By now, we have been up the better part of 24 hours and it’s only 3PM local time – so we went for a walk about to find a glass of wine and some cheese. Stopped into a cafe for some house wine and cheese – nothing special to report…just a snack. After that we found our way back to our hotel without any problems! (Ok we didn’t get very far that’s for sure). Here’s the view from the Dock of our hotel. So, at this point we are most likely in for the evening – with big plans for exploring, getting lost, getting a tour on the Grand Canal and basically doing what everyone should do when they come to this enchanting place. 06-4-16 & 6-5-16 We leave and arrive in Venice! Last year, while on our adventure in Spain, we decided to book a river cruise on the Danube. The cruise starts in Budapest and ends in Prague. However, prior to joining the cruise, we spend a week in Venice – exploring a new part of the world for us and trying to not get lost to many times. This will include a day trip to Verona. From Venice, we fly to Budapest and spend several days prior to boarding our UniWorld cruise – Delightful Danube & Prague. The River Cruise makes stops at Vienna, Spitz Village, Engelhartszell, Passau, Regensburg and finally Nuremberg. Once we arrive in Prague we spend an extra 4 or 5 days. As part of our stay in Prague we will be doing 2 day trips – South Bohemia visit a lovely village Holasovice, Cesky Krumlovand on the way home another historical town Třeboň. The other day we will see Central Bohemia – lovely countryside in the valley of Berounka river, visit a Glaswork in Nizbor and possibly visit romantic castle Krivoklat. Check back as updates will be posted frequently.